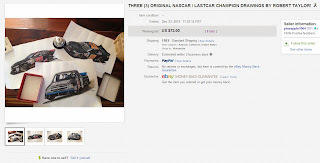 A huge thank you to everyone who participated in last week's LASTCAR Charity Auction, including everyone who bid, RaceTalkRadio.com and Jayski for promoting it, and of course artist Robert Taylor for contributing his incredible works! Thanks to you, we raised $72.00 to benefit research for Parkinson's Disease through a donation to the Michael J. Fox Foundation! 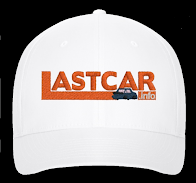 To the winner of the auction, your drawings will be in the mail this afternoon along with your code for a free copy of my first LASTCAR book. Happy Holidays, everyone, and stay tuned as we count down the final 50 days before the Sprint Unlimited at Daytona and the sixth season of LASTCAR! 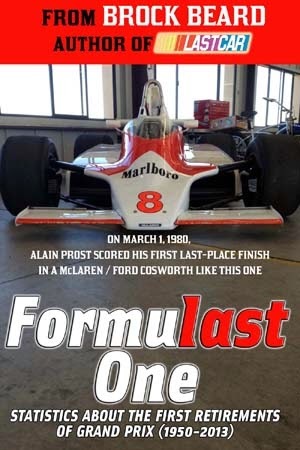 Formulast One: Statistics About the First Retirements of Grand Prix (1950-2013) - ON SALE NOW! For those of you who visited this site in 2012, the material in this book was originally on a second website of the same name. The site used a similar format to LASTCAR, only it dealt with the last-place finishers of Formula One races. Unfortunately, the site did not take off, so I decided to take it down and publish the statistics in their own book. The good news is that for $2.99, you can now get those statistics and more! *A complete annotated season-by-season, race-by-race list of the last-place finishers of every Formula One event run from 1950 through the present, organized by date, listing the driver’s nation of origin, car number, chassis and engine manufacturer, and indicating how many last-place finishes each driver had scored to that point. *Season-ending rankings showing which driver(s) scored the most last-place finishes at the end of each season. *Rankings originally published on “Formulast One,” now current through the 2013 season, which rank the most finishes by driver, country, chassis manufacturer, and engine manufacturer. For $2.99, you can download my book to your computer on Amazon.com or in virtually any format, including Microsoft Word and PDF, at Smashwords.com. Both web sites include a free sample of my book that can be downloaded on any device. And, just like my other three books, those who purchase this book will also have it updated for free at the end of the 2014 season. So, if you’d like a little something different, be sure to pick this one up! 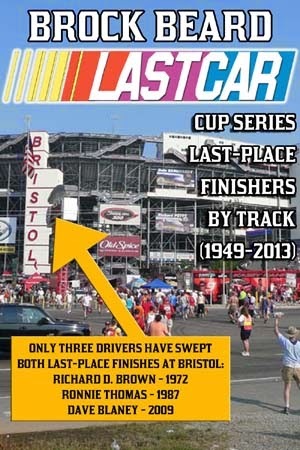 LASTCAR: Cup Series Last-Place Finishers By Track - ON SALE NOW! Do you know which driver has the most last-place finishes in the Daytona 500? Or which driver finished last the most at North Wilkesboro Speedway? Or which drivers picked up their first career last-place finishes at Richmond? This eBook contains a brand-new collection of last-place statistics, organized alphabetically by track. 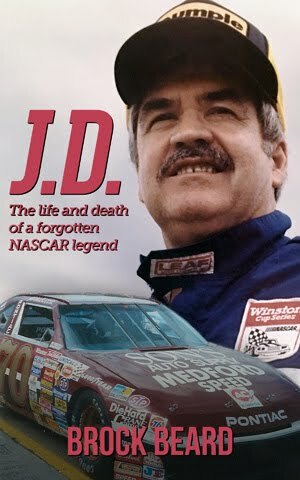 *Never-before-published articles about every track on which the Cup Series has competed since 1972, organized in a track-by-track format, including tracks no longer run today such as Riverside International Raceway and North Wilkesboro Speedway! 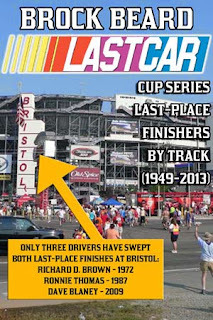 *Complete rankings since 1949 showing which drivers have the most last-place finishes at each of those Cup Series tracks, current through 2013! *Detailed lists for every track about which drivers scored their first Cup Series last-place finishes at that track! *Expanded information on the last-place finishers of today’s exhibition races, including the Sprint Unlimited at Daytona and the NASCAR Sprint All-Star Race! 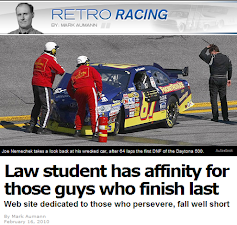 *Profiles of notable last-place finishers and other significant last-place moments that occurred at each track! To get your copy for just $2.99, click here to get it at Amazon or if you prefer a different format, you can get it here at Smashwords! Both web sites include a free sample of my book that can be downloaded on any device. Like my other two books, those who purchase this book will also have it updated for free at the end of the 2014 season! And in case you haven't heard, my two previous LASTCAR books have been updated through the 2013 season! Click here for more details! 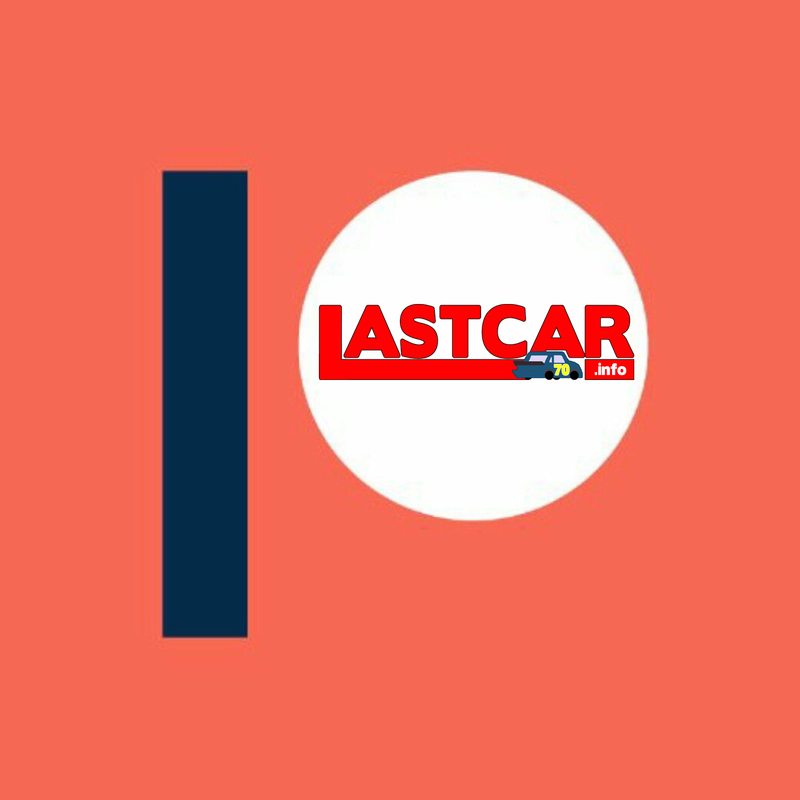 Thank you for supporting LASTCAR these past five years and stay tuned - I have two more LASTCAR books coming later this winter!